The Donington Historic Festival is ringing the changes for 2015, with a new line-up of world-class grids to create even more spectator enjoyment and excitement at this hugely popular international historic race meeting over the Bank Holiday weekend of May 2nd, 3rd & 4th. 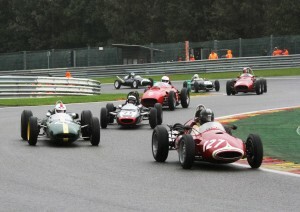 Saturday May 2nd sees the Festival kick off in style with the Historic Grand Prix Cars Association Combined Grid of Pre-1961 and Pre-1966 Grand Prix cars, the HSCC’s Historic Formula Two, and FJHRA/HSCC 'Silverline' Historic Formula Junior Championship Rear Engined and Front Engined races. The ‘feature race’ of the Saturday is the 1000km, a 150-minute spectacle driving well into the evening. It is designed to recreate the fabulous 1000km sports car battles of the early 1970s, when sports prototypes of up to five litres ran in some of the most spectacular racing ever seen. In the spirit of those original races, it will also feature Touring and GT cars of the period. On Sunday May 3rd, the Donington crowds will be treated to another ‘mini-enduro’, this time for the GT & Sports Car Cup. A series for genuine pre-66 GTs and pre-63 sports cars of a type that were raced in period in the World Endurance Championship, this is a highly glamorous and competitive affair. And those qualities continue with the Royal Automobile Club Woodcote Trophy for genuine sports-racers of the post-War era, up to and including December 1955. Sunday also sees second appearances by the HGPCA Combined Grid of Pre-1961 and Pre-1966 Grand Prix cars, and the two FJHRA/HSCC 'Silverline' Historic Formula Junior Championship grids. There’s more single-seater action from the HSCC Historic Formula Twos, while Touring Car fans are in for a treat with three fantastic races: the one-hour U2TC, featuring pre-1966 under two-litre Touring Cars, plus the HRDC’s ‘History of the BTCC 1958-1966’; while the HSCC Super Touring Cars brings things almost up to date by putting Touring Cars from pre-1980 to the end of 1999 out on track. This superb quality of race action and on-track variety continues on Bank Holiday Monday, May 4th. One exciting new grid is the HSCC Jaguar Heritage Challenge. Aimed firmly at fans of the Big Cats, of which there are many, this could include everything from XK 120s, C- and D-type Jaguars to Mk I and II saloons, plus numerous E-types. The Stirling Moss Trophy for pre-1961 sports cars (which recently won Race Series of the Year in the International Historic Motoring Awards) will bring some stunning machinery to Donington, and the ‘Mad Jack’ race for Pre-War Sports Cars will echo the very earliest days of racing at the circuit, where the relative lack of power of some of the cars is more than compensated for by the sight of the drivers sawing at wide steering wheels as mighty Bentleys share the track with tiny Bugattis, Aston Martins, Frazer Nashes and Lagondas. There’s more dramatic Touring Car action on the Monday, this time from Motor Racing Legends’ Historic Touring Car Challenge for 1966-85 Touring Cars and the HRDC ‘Touring Greats’ grids, and the HSCC Super Touring Cars will be battling it out once more. Away from the main track, new attractions for 2015 include displays and demonstrations from historic Formula 1 and Grand Prix cars – to commemorate the 80th Anniversary of the first ever Donington Grand Prix – plus ‘Supercars across the decades’. The ever-popular historic rally cars will be burning rubber once more, with the mighty Group B machines and the iconic cars of the Historic Rally Car Register entertaining the crowds. And both the race and rally car paddocks will be open to all visitors. Historic karts will also be returning to Donington Park for the event, as will the splendid displays in the infield, staged by dozens of car clubs. Advance discounted tickets cost £20 for a single day ticket, £32 for a two-day ticket and just £45 for a three-day weekend ticket (on-the-gate prices will be £25, £40 and £60, respectively). Children aged under 16 are admitted for free. Advance discounted tickets can be bought via www.doningtonhistoric.com and through the 24-hour ticket hotline 0844 873 7355. Advance ticket sales close at 5pm on Wednesday, April 29th 2015.